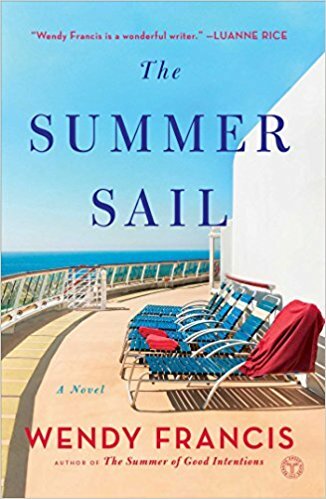 After not seeing her friends for a year, Abby decides to invite Caroline, Lee, and their families aboard the Bermuda Breeze cruise ship. "Abby slid the invitation into the envelope," writes Francis. "It was a lovely invitation, on sturdy cream card stock with blue script and a jaunty little boat sailing across the top. She knew it was silly to have ordered special cards in this day and age when everything got sent electronically, but a twentieth wedding anniversary seemed to demand a certain amount of decorum. And it was the perfect reason to celebrate. Every year, she and her two college roommates tried to meet up for a reunion somewhere in the States, but this year, she wanted to propose something different: a cruise, an island getaway to Bermuda. What could be more idyllic? "She sealed the envelopes, affixed the stamps, and addressed them in her loopy handwriting, one to Ms. Lee Minor in Charleston, South Carolina, and the other to Ms. Caroline Canton in New York. Abby smiled at the thought of her roommates' spotting the invitation in a seas of advertisements and magazines in their mailboxes. It was good to try something different every so often, and as she'd said to her husband, Sam, when first pitching the idea, If not now, then when? "Frankly, she was desperate for a proper getaway, one where she would be among friends, plied with good food and drink, and tasked with nothing more than a decision on where to dine that night (the ship had five elegant restaurants on board). Abby had barely survived the homestretch of her boys' sophomore year - both twins seemed intent on growing up too quickly - and she was counting on the cruise to entertain them with its endless loop of activities. Meanwhile, she could lounge by the pool in peace. "It was, as Sam liked to say, a win-win. "Now if she could just twist Caroline's arm to take a full week off from work and Lee to treat herself and he daughter to a vacation, all would be well. Abby would call them later, once they'd had time to consider the idea. The sales pitch was easy - Caroline needed to take a break from her stressful editor's job at Glossy magazine, and Lee and Lacey would use some uninterrupted time together to smooth things out between them. (Lee, a teacher, would be on summer vacation in June). Abby needn't mention any other reason - beyond her anniversary, of course - why it was so pressing that they come. They would find that out soon enough." As the Bermuda Breeze pulls away from the pier, everyone is looking forward to a week of lounging by the pool, sipping sunset cocktails, and reminiscing together. Soon after, though, they realize their adult problems won't just disappear at the beach or during cocktail hour. Hard-working Caroline anticipates several crucial days with her boyfriend, Javier, who she may leave if he doesn't propose on this trip. Lee, a single mother, desperately wants to win back the affections of her formerly sweet daughter, Lacey, who after her first year in college, has returned home a much more difficult person who is harboring a secret. Abby, who takes the role of mother hen of the group, will renew her vows with her husband, Sam. The thing is the couple is hiding a major problem from everyone else, including their twin sons, Chris and Ryan. The Summer Sail, Francis' follow-up to her critically acclaimed The Summer of Good Intentions (2015), is an emotionally satisfying, page-turning beach read, the fascinating story of a vacation these friends will never forget, just not for the reasons they expect.